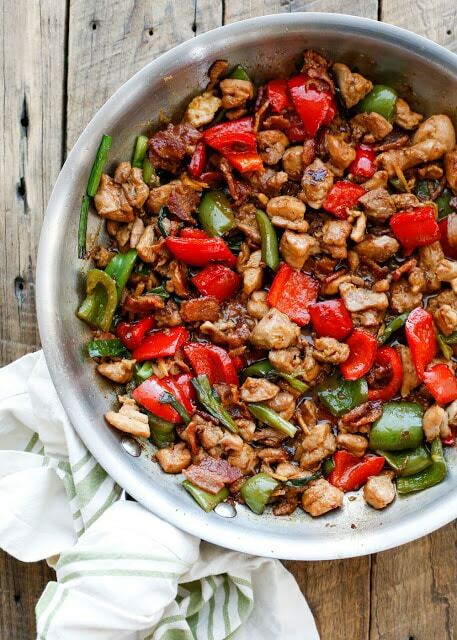 Tender bites of chicken, salty bacon, and crisp bell peppers are tossed in a fantastic sweet and spicy sauce to make our all-time favorite Chicken Stir-Fry. Just a little bit of bacon adds a huge amount of flavor to this meal. It takes almost no extra work and the unexpected salty bites are irresistible. 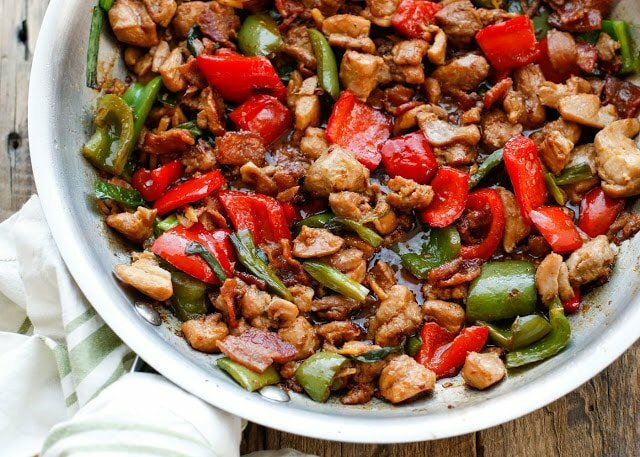 For several years now, this spicy Chicken Stir Fry has been Sean’s go-to dinner to make when he’s in charge of cooking. Sean was actually the first one to make this recipe when I found it in an issue of Everyday Food. When Sean offered to make dinner one night several years ago, I handed him the magazine recipe. “Best Chinese food you’ve ever made” was my kids’ verdict the first time we made this recipe. We’ve made the recipe countless times since then, adapting it slightly and making changes here and there to make it even better. Every single time, we all clear our plates and even go back for seconds. I think the reason why this has been a favorite from day one is the BACON. There are few recipes that aren’t made even better by adding a bit of bacon to them. The spicy sauce in this recipe is a simple mix of soy sauce, brown sugar, fresh ginger and chili paste. The sauce from this recipe alone would be delicious on just about any time of stir-fried meat and vegetables. It only takes a couple more minutes than using a store bought sauce and delivers TONS more flavor. This is a very simple stir fry with outstanding results. It has been making regular appearances on our dinner menu ever since and when I made this stir-fry again last week, I decided it was way past time to update the photos. The key to stress-free stir-fry recipes is prepping everything in advance. Make sure that every ingredient is lined up next to the stove before you turn on the heat. The bulk of the prep time for this recipe is spent slicing and dicing the meat and vegetables, give yourself about 20 minutes for prep time. Once everything is assembled and ready to cook, the actual cooking time is just a few minutes. Cut similar ingredients the same size to help things cook evenly. MEAL PREP TIP: Chop all the veggies and meat in the morning or the day ahead. Store them in an airtight container in the fridge so that, come dinner time, all you have to do is pull everything out of the refrigerator. A little planning will make this homemade meal even faster than take out or a frozen dinner! Those of you who’ve been reading for a while have probably gathered that my family loves a little (or a lot) of heat in our food. The spice in this chicken comes from a spoonful of Asian chili paste and a nice dose of fresh ginger. If you aren’t a fan of spicy heat in your foods, feel free to reduce the amount of chili paste in this recipe. However, if you DO like some heat on your plate, check out these other spicy chicken recipes. A batch of Spicy Honey Brushed Chicken is great on salads, or over rice. It’s also terrific on sandwiches. These Spicy Chicken Patties by Family Food On The Table are going to make amazing sliders soon and Spicy Chicken Rigatoni is going on my meal plan too. The Spicy Chicken Tamale Pie is a great combination of Southwestern flavors with green chile, red chile, and chipotle peppers in the mix. Stir-Fry is a mainstay in my meal planning rotation. 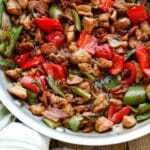 Stir-fry recipes make it so easy to cook a well-rounded meal with lots of vegetables and meat that everyone enjoys.I have enough Chicken Stir-Frys in my arsenal that we never grow bored of eating the same stir-fry over and over. If you like the ginger flavor in Chicken and Bacon Stir-Fry, give this Ginger Chicken and Broccoli Stir-Fry a try soon. We also love Orange Chicken Stir-Fry that mimics a popular take-out favorite but has more flavor than most restaurant versions I’ve had. For a stir-fry dish that features noodles as the starch instead of rice, check out Stir Fry Noodles with Chicken and Vegetables. Rice noodles, vegetables, chicken and an incredible sauce come together in a pan to satisfy even your most intense late night craving for Chinese food! In a large bowl, whisk together the arrowroot and the egg white. Toss the chicken pieces in this mixture and set aside. In a small bowl, whisk together the soy sauce, brown sugar and chili paste and set aside. Heat a large skillet over high heat. Add the bacon pieces and cook, stirring frequently, until they are crisp and browned approximately 7 minutes. Drain all but 1-2 tablespoons of bacon grease and add the chicken and the ginger to the pan. Cook over high heat until browned, approximately 3-4 minutes. Add the bell peppers and green onions and stir to combine. Cook over high heat, stirring until crisp-tender, about 2-3 minutes. Cook about 2 minutes, until the sauce is thick enough to coat the meat and vegetables. In a large bowl, whisk together the arrowroot and the egg white. Toss the chicken pieces in this mixture and set aside. In a small bowl, whisk together the soy sauce, brown sugar and chili paste and set aside. Heat a large skillet over high heat. Add the bacon pieces and cook, stirring frequently, until they are crisp and browned, approximately 7 minutes. Drain all but 1-2 tablespoons of bacon grease and add the chicken and the ginger to the pan. Cook over high heat until browned, approximately 3-4 minutes. Add the bell peppers and green onions and stir to combine. Cook over high heat, stirring until crisp tender, about 2-3 minutes. Add the soy sauce mixture and stir to combine. Cook about 2 minutes, until the sauce is thick enough to coat the meat and vegetables. Enjoy! The key to stress-free stir-fry recipes is prepping everything in advance. Make sure that every ingredient is lined up next to the stove before you turn on the heat. The bulk of the prep time for this recipe is spent slicing and dicing the meat and vegetables, give yourself about 20 minutes for prep time. Once everything is assembled and ready to cook, the actual cooking time is just a few minutes. transferring to an airtight container or freezer safe Ziploc bag. Thaw completely in the refrigerator before reheating in the microwave or on the stove-top. Marjie, you totally cracked me up! That would work for me too. Kelly, I'm glad he liked it! 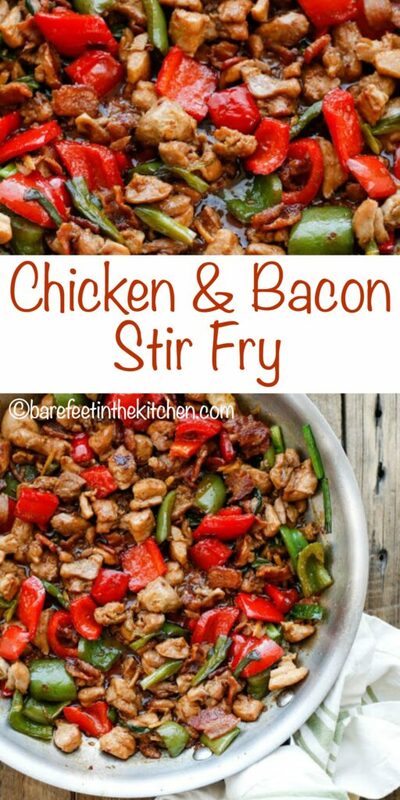 I've used bacon in stir fry before and it really does bring a whole other dimension to the meal! This sounds amazing.. can't wait to try it! We've made this several times. It is requested at least once a month now. Love it! Oh yes, how could this not be good! Thanks for the mention of my stir-fry! Would it be OK to leave out the chili paste, or is there something (milder) that can be substituted? You could use a lesser amount of chili paste or leave it out entirely if you don't want any heat at all. However, this stir-fry isn't crazy hot as it is written. This looks beyond delish Mary! I love using chicken thighs (as I know you do) in recipes like this for all the flavor!! Thanks for including my recipe too. This looks yummy, and super easy (which I love). Thanks for sharing! Cooking this tonight for the kids hope it turns out as good as yoirs! I LOVE this stir fry! We had it last night again, as a matter of fact! We have probably had in 5-6 times so far. But oh boy, we can only use EXACTLY 1 tablespoon of the chili paste, not heaping or anything, because it is too hot for us when that has happened! We also put the green onions on the top raw after the stir fry is in our bowls. Thank you so much for this awesome recipe!!! I'm thrilled that you enjoy this stir fry as much as we do, Gladys!